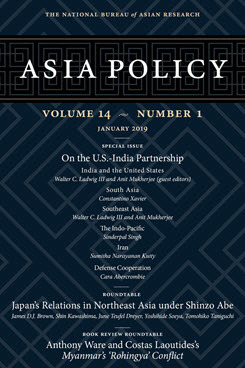 This article examines the India-U.S. strategic partnership and argues that the Iran factor is not as big an impediment to the bilateral relationship as is often assumed. The India-U.S. relationship is not as sensitive to the Iran factor as is frequently depicted. Both sides are accommodative of each other’s strategic interests and have so far taken the long view when dealing with their differences to avoid major disruptions in ties. India, being the regional power with global aspirations in this partnership, is additionally willing to adapt and absorb certain costs, as seen during the U.S. sanctions against Iranian oil imports in 2012, and more recently in 2018, in return for U.S. accommodation of its interests in the region, primarily the Chabahar port project that is closely tied to Afghanistan’s economic security. To resolve differences, the two countries conduct bilateral negotiations in private at the highest levels of leadership and work to cultivate an understanding on how each side sells disagreements to their respective domestic audiences. A more transactional U.S. administration should not expect India to abandon its strategic autonomy in rhetoric. However, in practice, India has proved willing to meet the U.S. halfway, as demonstrated in the case of Iran. India’s investment in the Chabahar port and trilateral connectivity initiative contributes to Afghanistan’s economic security and should be viewed as complementing U.S. strategy in South Asia. India’s presence in Iran also benefits their combined balancing strategy against China in the region. The India-U.S. strategic partnership would benefit greatly from regular, direct engagement over differences. As the two countries begin bilateral consultations on the Middle East, dealing with disagreements, rather than sidestepping them, would enable each side to more clearly understand how the other thinks and operates and to leverage their complementary strengths. Sumitha Narayanan Kutty is an Associate Research Fellow in the South Asia Programme at the S. Rajaratnam School of International Studies (RSIS).